Excuse the interruption of CES coverage, but we've at long last closed the GOOGL proposition. As traders can see from the chart above, Yahoo.com's Alexa daily-reach metric surpassed Google.com's on December 31, 2007; meaning the stock closes at $0. It was close, to be sure, but Yahoo's a clear winner on this one. Nevertheless, faith in Google seemed to hit an all-time high with this stock. An optimistic 96 percent of you favored Google. Be on the look out for a new stock. And, as always, Happy Trading! Does any body else find it odd that a Yahoo based reaserch group was used to confirm this stock. Yes, Alexa! It was the source specified in the proposition. Technically, the prop was not will Google pass Yahoo, but will Google pass Yahoo in Alexa's daily-reach metric. The chart was available all along and I checked it often. Google did not pass Yahoo for even one day, although in early December it was close. I never understood why the price was so high. Another thing is that Alexa's web stats tracking toolbar only runs on IE and not Firefox. If FFX was supported then Google would pass Yahoo due to the default search and homepage in FFX which are both by Google. 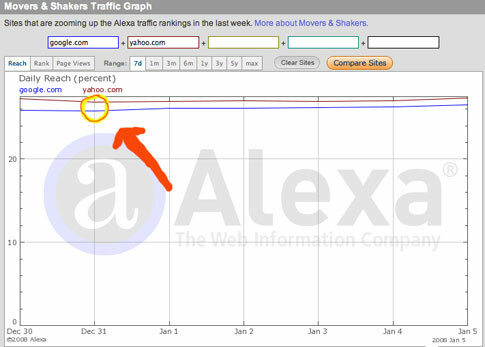 Even if FFX were supported by Alexa, the proposition was still confined to the metrics used by a single source. PPXKingOfTheHill points out the importance of the wording of the proposition--however, traders' perceptions of the proposition must necessarily influence their beliefs, which in turn will influence their trading behavior. The idea behind this market, furthermore, is to aggregate information that all traders--read: interested, rational parties--have about the likelihood that a given proposition will obtain. Of course, even if we note in retrospect that Alexa might not be a truly impartial source (hence PPXK.O.T.H. 's confusion at the high trading price), the high price indicates that the traders who opted in to buying the futures believed that Google stands a chance of being #1; how the involved traders reached their conclusions is another matter. Lesson learned: maybe we should take bets on what constitutes an impartial metric before we start trading. I would point out, however, that nobody seemed so keen to up the ante even toward the end of the proposition's time horizon. Also note, Alexa reported that Google still lagged right up toward the end of the year. The results of the market are probabilistic; we as traders never did believe with absolute assurance that the proposition would obtain. Arnica montana is effective for bruising and/or swelling.